forces of nature, such as wind, sun, clouds, etc. 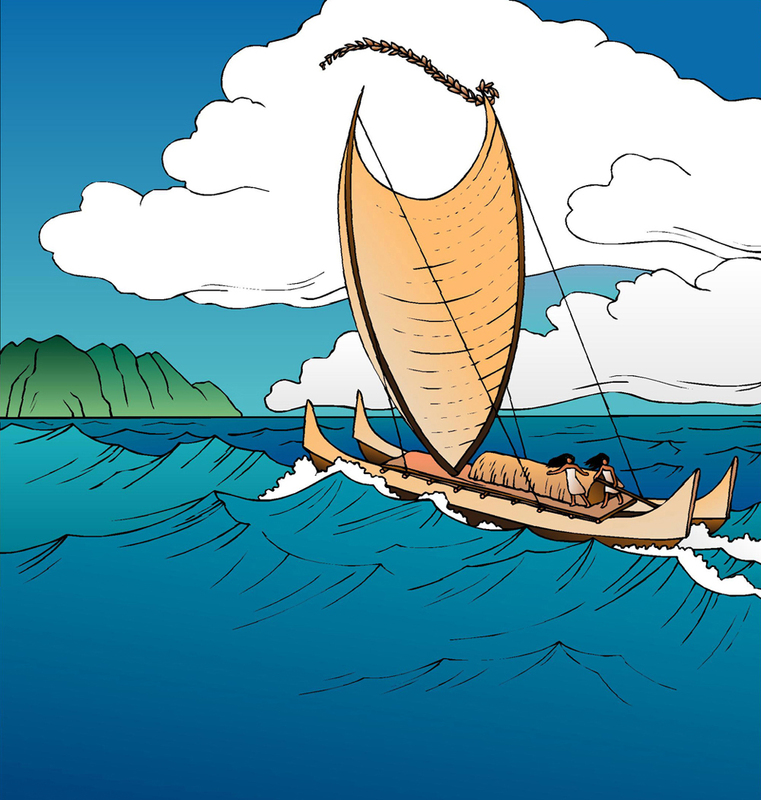 What are the main parts of a Hawaiian canoe? 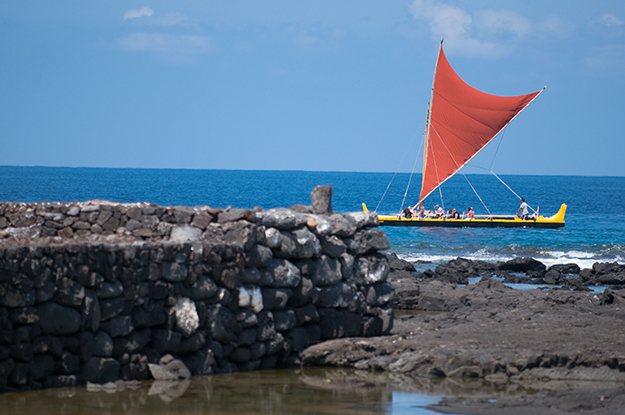 Why does ʻAnakala Kālepa say the sailing canoe is a symbol of Hawaiian culture and intelligence? If you were just out of high school and were invited to get on board the Hōkūleʻa, would you do it? Would you know what to do? Would you be excited? Afraid? Both? What is the difference between modern and traditional navigation? Should teachers be allowed to take students on sailing field trips? Why or why not? Canoes used to be the main way to get from island to island. These days, if you were to sail to another island instead of taking a plane, what would you pack for the trip? Make a list and discuss it with your teacher or parent. Kihe ka ihu i ka ʻale. One who sneezes when the spray from the surf rises at the bow of the canoe. Do you have family living far away? Do you get to visit them often? Sometimes the distance can make it hard to connect with other family members. For the peoples that became the first settlers of Hawaiʻi, the Pacific Ocean was not seen as a dividing barrier but a network of pathways. It became a connection between people who share similar cultures, moʻolelo (stories), and moʻokūʻauhau (ancestry). Kānaka ʻōiwi (Hawaiians) navigated by the stars, winds, waves, and other natural phenomena to cross thousands of miles of open ocean. 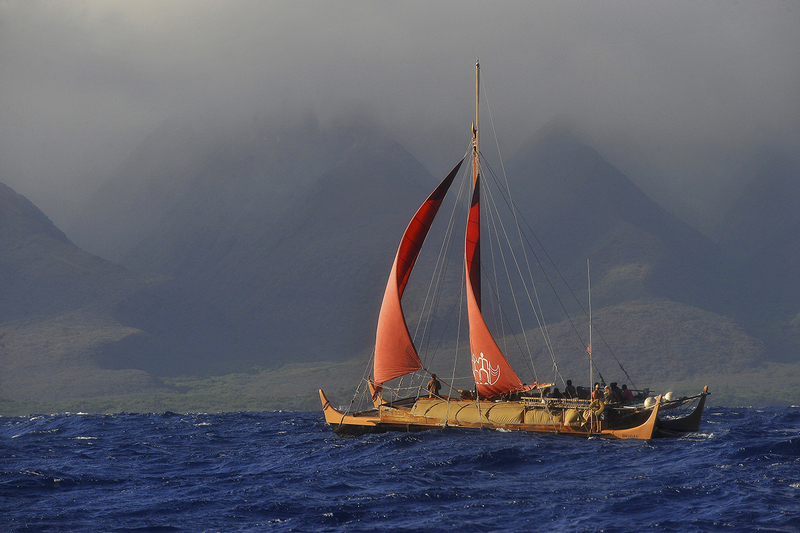 Hoʻokele (navigation) traditions are part of the very fabric of kānaka ʻōiwi origins. Some expeditions and the deeds of famous navigators have been recorded in mele oli (chants) and are an important part of Hawaiian history. Poʻe hoʻokele (navigators) were originally of the aliʻi class. Poʻe hoʻokele were skilled at ʻoihana lawaiʻa (fishing), ʻoihana kilokilo (astronomy), and hōʻike honua (geography). They also studied the habits of birds, fish, and the seasons in relation to the phases of the moon. The best poʻe hoʻokele were so good at navigation that they were thought to possess magical powers. Traditionally, the voyaging waʻa (canoe) was made of large koa trees cut down with a stone adze called a koʻi. Two hulls linked by a central platform were used to balance the canoe and provide a place for shelter. This type of canoe is called a waʻa kaulua or double-hulled canoe. The canoe was lashed together using cordage made from the husk of the niu or coconut. The rope, called ʻaha, was waterproof, flexible, and durable. The sails of Hawaiian canoes were woven from the lau hala (pandanus leaves). The voyaging canoes were made to withstand thousands of miles of ocean travel. Food was a very important part of the journey. For example, niu (coconut) held water sealed from the salt air. It also was a source of food and oil. Kalo was pounded into paʻi ʻai and wrapped in ti leaves. In this state the kalo would be preserved for months at a time without fermenting. Water could be added to it to make poi or it could be eaten straight and allowed to expand in the stomach. These food plants are still an important part of the Hawaiian diet. The waʻa kaulua, the plant foods of kānaka ʻōiwi, and the sharp mind of the navigator, were the tools used to populate the Hawaiian Islands. There are many notable poʻe hoʻokele throughout Hawaiian history. These poʻe hoʻokele are a part of Hawaiʻi’s highest-ranking aliʻi and most important kāhuna. The earliest and most renowned Hawaiian hoʻokele was named Hawaiʻiloa. While traveling with another famous hoʻokele named Makaliʻi, Hawaiʻiloa and his companions are said to be the first ones to land on Hawaiʻi’s shores. Hawaiʻiloa later returned to his homeland to retrieve his wife and children. They arrived back in Hawaiʻi where they became the foundation for the Hawaiian people. The names of Hawaiʻiloa’s children and grandchildren are remembered in the names of the islands like Maui and Oʻahu. Other wahi pana are also named after important events and people in Hawaiʻiloa’s life, such as the famous mountain peak Waiʻaleʻale that was named after his wife. Hawaiʻiloa is said to have traveled throughout the Pacific to visit his brothers who became rulers of other island chains like the Marquesas, Sāmoa, and Tahiti. He also would practice his hoʻokele skills to retrieve suitable partners for his high-ranking children. 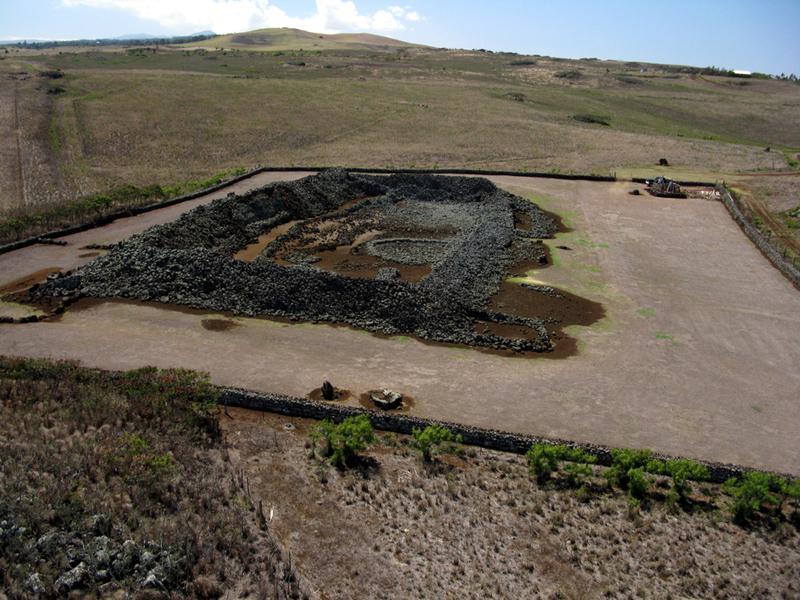 Another famous hoʻokele changed Hawaiian religion, introducing the war god Kū and the luakini heiau for human sacrifice. Paʻao was a priest from Kahiki. Paʻao left his home in the South Pacific because of family turmoil. Paʻao sailed to Hawaiʻi. He arrived in Puna where he built the first luakini heiau in Hawaiʻi named ʻAhaʻula. He then traveled to Kawaihae where he built Moʻokini heiau. The land did not have a chief and so he retrieved one from Kahiki. Paʻao and his descendents were prominent kāhuna all the way up to the time of Kamehameha I whose kahuna was Hewahewa. After a flood in Waipiʻo, Hawaiʻi, the aliʻi ʻOlopana and his wife Luʻukia sailed to Kahikinui to live. Upon their arrival, Luʻukia began an affair with Moʻikeha, a chief from Kahikinui. At first, ʻOlopana was not concerned because the relationships of the aliʻi at that time were different. However, ʻOlopana became jealous and told lies to Luʻukia to get her to despise Moʻikeha. Moʻikeha decided to leave with his foster son and go to Hawaiʻi. Moʻikeha eventually arrived at Kauaʻi where he became a ruling chief and had five children. Moʻikeha was so happy with his new life he forgot Luʻukia. He soon began to miss his first son Laʻamaikahiki. He decided to send one of his sons to fetch Laʻa and bring him to Hawaiʻi. A contest proved his youngest son Kila possessed the skills to accomplish the task. Kila returned to Kahikinui and retrieved his brother Laʻamaikahiki and they both return to Hawaiʻi. At some point, voyaging throughout the Pacific was quite frequent. 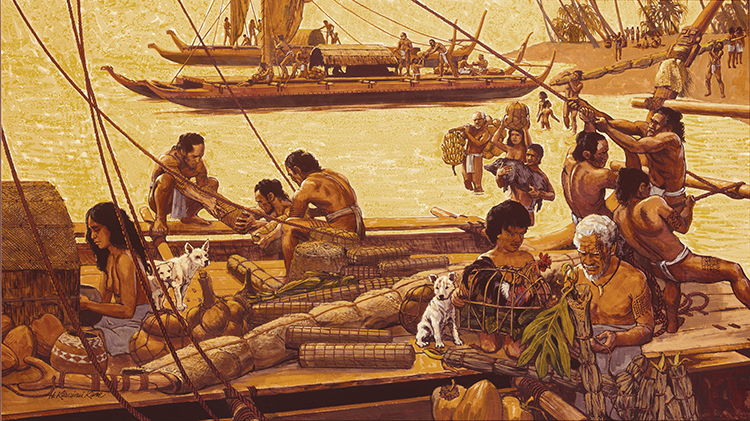 This slowed down as kānaka (people) settled and became comfortable with their new home in Hawaiʻi. Upon the arrival of Captain Cook in 1778, there was little evidence that long-distance voyaging was still being practiced. Western scholars speculated how Polynesians populated the Hawaiian Islands, some 2,000 miles from the nearest land. Many doubted that a culture with no metal, no textiles, and no modern navigational tools could have made such epic journeys. On March 8, 1975, a double-hulled canoe was launched into Kāneʻohe Bay. Ceremonies marked the beginning of a revolution in cultural revitalization. From that day the canoe named Hōkūleʻa has sailed back and forth to Tahiti, Aotearoa, and Rapanui. Hōkūleʻa has become a symbol of linking the peoples of the Pacific through ancient ocean pathways. Other double-hulled canoes have been built and launched across the Pacific. Navigators and sea captains are trained in a blend of modern and traditional techniques of hoʻokele. Today’s hoʻokele are no longer adventurous aliʻi looking for new lands. The students of hoʻokele today are searching for ways to navigate an ever-changing world. Through the practice of hoʻokele, students are striving to hold on to their traditions and to understand their past so that they have the tools to determine their futures. These waʻa kaulua travel the open ocean to share new ideas and reconnect with the ancestors. E ʻike ka hōkū o ka nalu, ʻo hōkū ʻula, ʻo hōkū lei. Behold the stars of the waves, the red star, the wreath of stars. When the rising and setting stars are near the ocean horizon, they provide clues to direction. From a chant in the story of Pākaʻa and Kūapākaʻa. The canoe has come ashore. Hunger is satisfied; desire fulfilled. Ka manu kaʻupu hālō ʻale o ka moana. The albatross that observes the ocean.